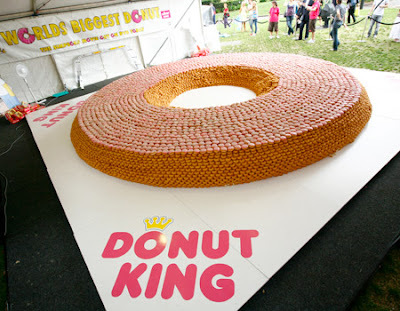 All Graphical: World Biggest Donut? Although this is not exactly a single whole donut, this is considered to be the biggest donut by its combined sheer mass of 3.5 tons. 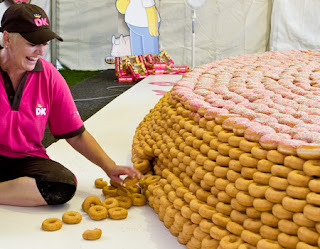 This beautiful sugary treat would cause Homer Simpson himself to go into a diabetic drooling frenzy by look alone. The majority of the weight were from the astonishing 90,000 donuts. 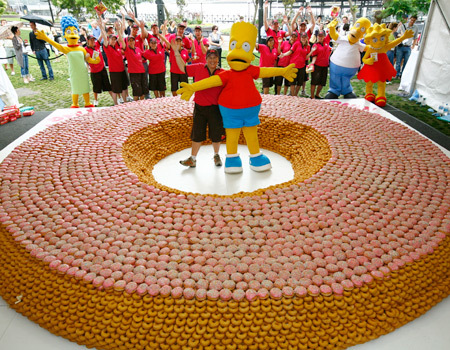 This sweet monstrosity was created in Sydney, Australia to promote the release of The Simpsons Movie on dvd. The overall formation measured 6 meters across. 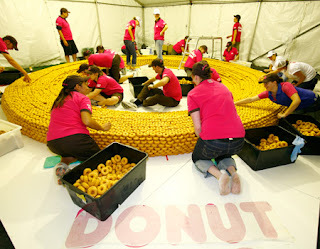 Donut King, the creator of this donut conglomeration, is basically the Australian version of Dunkin Donuts. They tasked a total of 65 employees to the production of this tasty project. The amount of pink icing used equaled to about 453 kilograms. 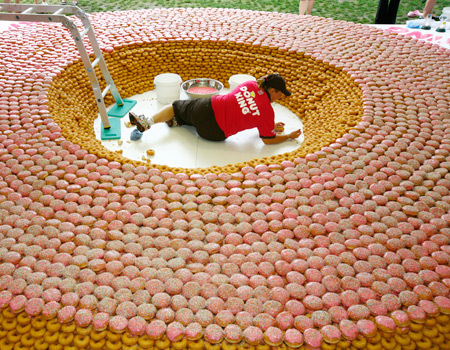 Around 30 kilograms of sprinkles were applied. This would not be complete without the Simpson family being there. Although one might expect Bart to completely wreck the creation. Some minor reparations being done. After the event, none of the resources were wasted. 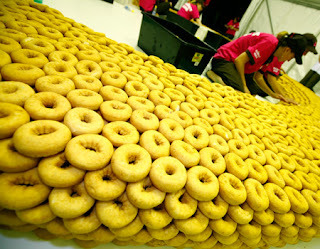 A total of 10,000 donuts went to Oz Harvest, an organization that feeds the needy. The rest of the donuts went to a company that generates electricity from the methane of decomposing food. oh man, 3.5 tons, that ridiculous. Wow, this is amazing. 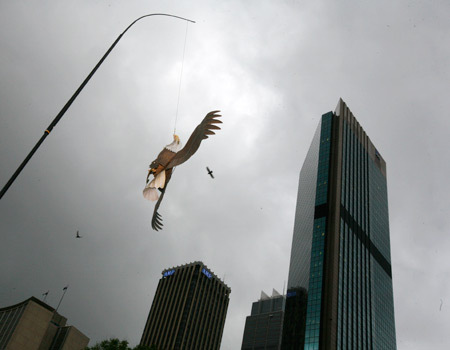 Very creative of them on how to keep the birds away. I'm sure us Americans are working on a way to top it already though. /sigh. It would've been so awesome if she had to eat her way out! Yeah, I wonder how sanitary that actually is, I don't see any rubber gloves. That looks really nice :)! It actually looks really comfortable. Like a donut bed. 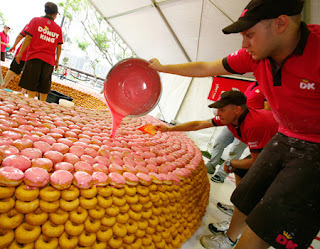 3.5 tons of doughnut, AYE CARUMBA! Doesn't count, gotta be one whole one. 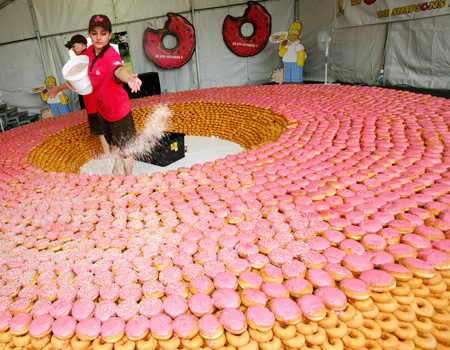 Though, that is a lot of donuts. I would love to have all of them for my self! I wonder how compressed the bottom layer was..
All these donuts are making me hungry. wow that's awesome. I love how they used the fake bird.